You could choose to eat 1 cup of rice for 170 calories that you’ll probably burn through pretty quickly thanks to the 38 grams of carbs and limited fiber. 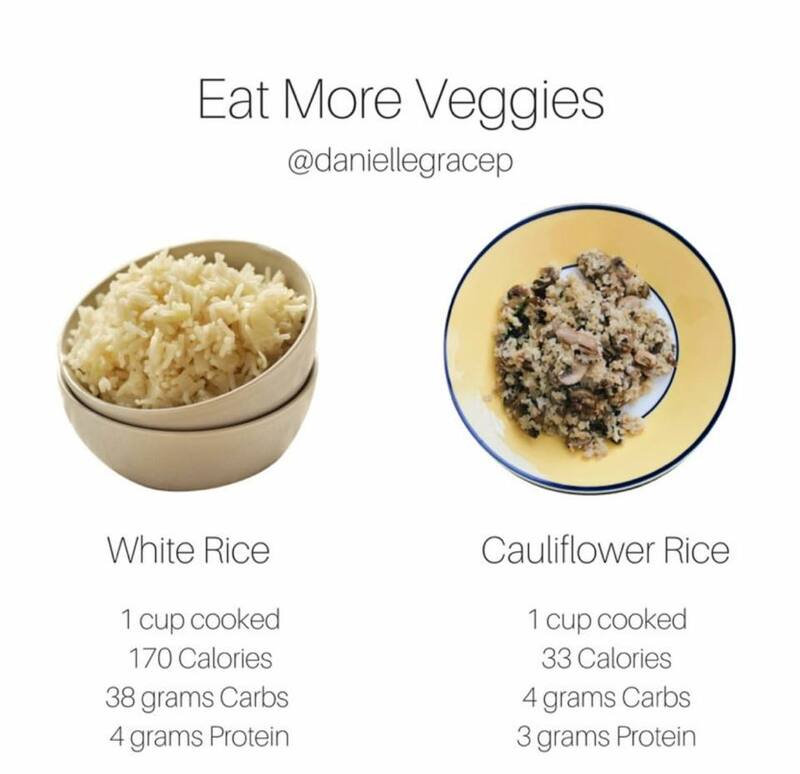 You can fill up on many cups of cooked cauliflower rice for way less than 170 calories. You’ll also feel more satisfied because it’s packed with fiber so you’ll digest it nice and slow. And little secret… it doesn’t taste like vegetables. I am the pickiest eater ever and I love it! It takes on the flavor of whatever you cook it with so you won’t even notice you’re not eating actual rice. Who’s tried cauliflower rice?! Love it or hate? 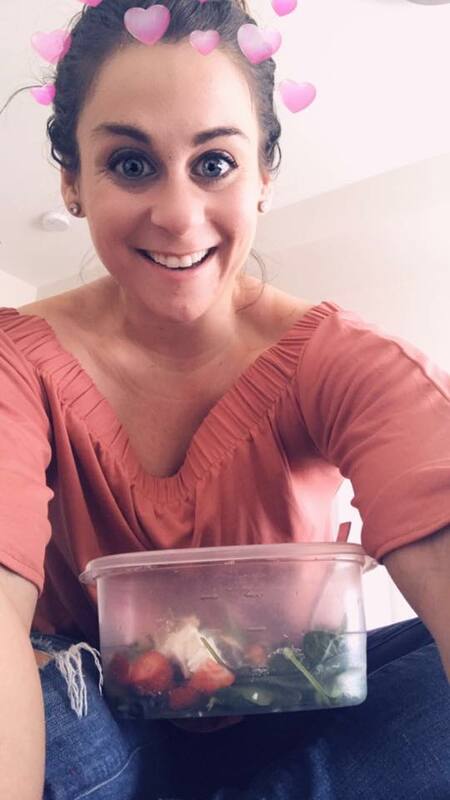 This entry was posted in Nutrition, Recipes and tagged clean eating, eat more vegetables, health coach, nutrition coach, nutrition facts, vegetables, weight loss on April 12, 2018 by danielle. 1. Cut each squash in half lengthwise. Scoop out seeds. Place squash halves, cut sides up, on a baking sheet. Bake at 350° for 50 minutes. Scrape inside of squash with a fork to remove spaghetti-like strands. 2. Heat a large skillet over medium-high heat. Add oil to pan. Add spinach; cook until spinach wilts. Remove from heat. Combine spinach mixture, squash strands, ricotta cheese, salt, and half of mozzarella cheese together and remove from skillet. 3. Return skillet to medium-high heat. Add turkey to pan; cook 4 minutes or until browned. Add sauce; cover, reduce heat to medium, and simmer 4 minutes. 4. Mix in spaghetti squash into skillet. Sprinkle evenly with remaining mozzarella cheese and Parmesan cheese. Cook until cheese is melted. 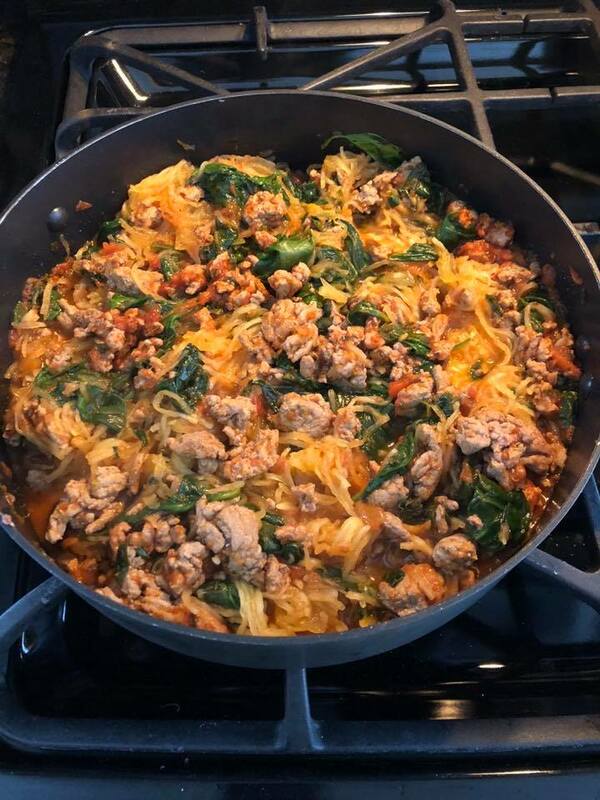 This entry was posted in Nutrition, Recipes and tagged clean eating, gluten free, gluten free recipes, recipes, spaghetti squash on April 5, 2018 by danielle. So easy… portobello mushrooms cooked for 5 minutes at 400. Top with spinach, crushed tomatoes, cherry tomatoes, and cheese and bake for 20 minutes!! So good!! 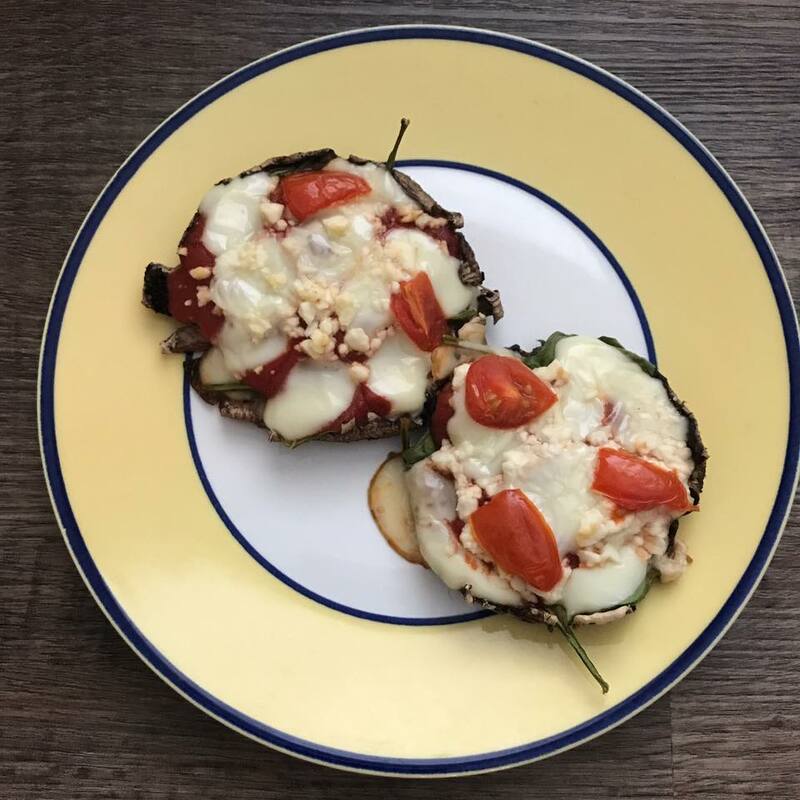 This entry was posted in Nutrition, Recipes and tagged clean eating, gluten free, healthy pizza, Pizza on March 11, 2018 by danielle. I just went live in my client group because I get this question a lot!!! So what to do?! Eat normally, make good choices, stick your plan, drink lots of water, MOVE, but don’t overdo it, and most importantly, listen to your body! This entry was posted in Nutrition, Recipes and tagged clean eating, fitness coach, health coach, nutrition tips on February 27, 2018 by danielle. In a skillet saute zucchini noodles, mushrooms, and carrots. While cooking stir in 1 tbs. natural peanut butter, 2 tbs. low sodium soy sauce or coconut aminos. Top with crushed peanuts and enjoy! 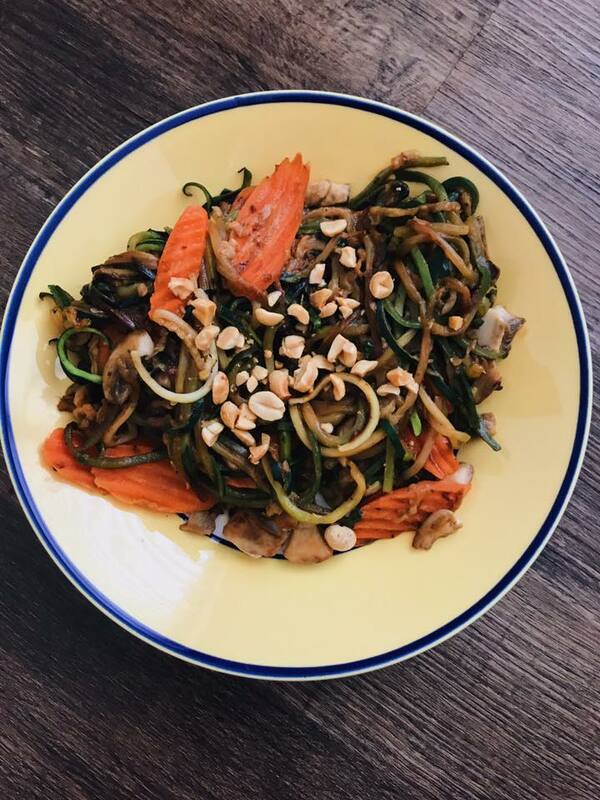 This entry was posted in Nutrition, Recipes and tagged clean eating, gluten free, healthy recipe, nutrition, pad thai, Zoodles on February 25, 2018 by danielle.